Our Loire Valley tour continues. Each morning as we load the bus, our guide asks how we are. Ça va? Vous avez la patate? Vous avez la pêche? Vous avez la banane? Do you have the potato; the peach; the banana? Each is a clever way to ask: Are you bright-eyed and bushy-tailed today? Oui, j'ai la patate. Every language has its apt idioms. Students scrutinize the fashion of their French peers. While I see few differences, they are keenly aware of every one and school me on the distinctions. Their shoes. They just look like sneakers to me. Their jeans. Everyone wears skinny jeans, even the boys. Their jackets. They're longer and actually match their outfits. Their hair. The guys have a lot of quiffs. What's a quiff? It's like a whoosh or a puff. Oh, you mean like a pompadour. My fashion eyes are definitely too old. The students negotiate the topiary labyrinth at Chenonceau, more interested in the grounds than the interior of the chateau. While they visit the donkey farm to the side of the sycamore-lined entryway, I discover an elegant orangery-style restaurant tucked behind the cafe. I'm off in a daydream, imagining a romantic dinner with my husband in the not-too-distant future. Although this is my fourth visit to the castle (my first was in '78 with Joe, as students freezing on motorbikes), Chenonceau never fails to charm. I send my stateside travel partner a text: We must return and stay at one of the village's ivy-covered inns; Chenonceau now has a gourmet restaurant! The chateau boasts two magnificent gardens designed by the two women in King Henri II's life: one by the mistress and one by the wife. I choose the one that's more shaded and compact, that of her majesty, Catherine de Medici. Daffodils, hyacinths and other early spring blossoms have made their way into full color, so different from the austere, pallid portraits of the queen inside the castle. The persona I assume is Diane de Poitiers, however, the beautiful, fashionista mistress of the king, twenty years his senior. The original cougar, I think with a chuckle; a fitting observation by a woman who just turned sixty. One day, some day, I'll morph into Diane at a costume ball, despite the fact that her calculating ruthlessness is about as distant from my personality as I can fathom. But that's what masquerades are about, no doubt. The gardens are now under a soft, spring drizzle. 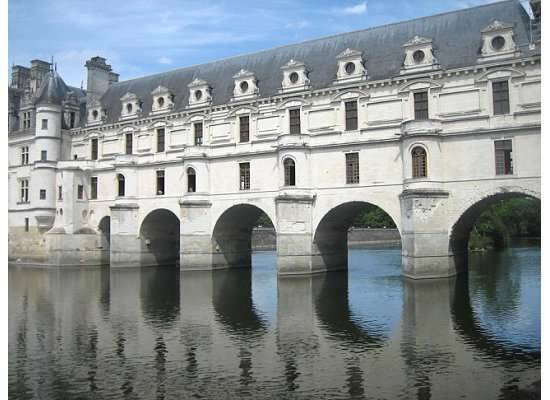 I envision royal steeds trotting up the sandy lane to deposit me at Chenonceau's drawbridge from a gilded coach. But I'm brusquely yanked back to the present as a student calls from behind a colossal planter: What time do we have to be back on the bus, Madame Bohr? Are we late? My travelers are astounded by the size of the four chateaux we've visited. Wait 'til we see Versailles, I say. Versailles? I can't wait to go to Versailles. Part of Kim Kardashian's wedding was there! Some things my students say make me less proud than others. We've made it to gentle, lovely Normandy. Apples and butter, Camembert and cows. We're in the land of crêpes and galettes. No drama, no high emotions today, not until we reach the D-Day beaches tomorrow. For now, I revel in the calm of Mont St. Michel's cloister, an oasis in this spikey medieval stronghold and pilgrimage destination jutting out into the English Channel. This place looks like a French Hogwarts, and this would be the dining hall. Perfect. Dozens of seagulls soaring overhead -- look how cute they are up close! So, Mont St Michel was first built in the 700s? That's over 1,000 years ago! Your math skills astound me, I confess. What would our nine days be without a rude French waiter - actually quite difficult to find these days. Monsieur Méchant, my students call him. They're using one of our vocabulary words! Mr. Mean. While they've learned to appreciate some French delicacies (poulet confit, profiteroles, pork rillettes, chicken liver pate, un croque monsieur), they occasionally fall back on the familiar. That may be the worst sandwich I've ever had. Ah, so you've learned an important lesson, non? Never order a baguette called The American in France! Hey, they're shooting a film - wow, a French actress! Do you know her, Madame Bohr? I think it's just a commercial or there would be more cameras, right? We stand and watch two takes, gawking from the sides of the cobblestoned footpath, as the thirty-something beauty performs a soliloquy on a cell phone. Our brush with Gallic fame for the day. I Google the actress that evening - redheaded French actress with blue eyes. How many could there be? And there she is: Audrey Fleurot, of Les Intouchables, Midnight in Paris and a yet-unknown film shot on Mont St. Michel. Thank God for that. J'ai la patate.